KATHMANDU, JULY 29: With various parts of the county severely affected by landslides and flooding, the victims struggle for survival due to lack of relief and the government's weak disaster preparedness. At many places, those hit by flooding and landslides are in a precarious condition, given the delays in relief initiatives. About 2,000 people of over 250 families have been displaced in Pyuthan district so far. 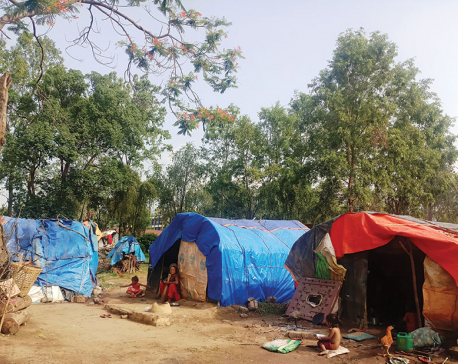 Among the displaced, 146 households are from Phopli VDC, 28 from Arkha, 22 from Puja, 17 from Libang, 15 from Syaulibang, six from Rajbara, four from Khung, and one each from Bhingri and Okharkot, informed Janak Raj Pant, coordinator of the District Disaster Relief Committee (DDRC), Pyuthan. “About 2,000 persons belonging to those households have been displaced. Many of them are sheltering with neighbors, or at local schools and sheds,” said Pant. The condition of the displaced children and elderly is particularly deplorable. The flooding has completely destroyed 107 houses in 12 VDCs, while 187other houses have sustained partial damage, according to the DDRC. About 2,000 people of over 250 families have been displaced in Pyuthan district so far. Many of them are sheltering with neighbors, or at local schools and sheds. Rescue teams comprising police and army personnel and locals are yet to find six persons who have gone missing since the past few days, according to Deputy Superintendent of Police (DSP) Ranjeet Singh Rathor at District Police Office (DPO), Pyuthan. Some villages received relief materials on Thursday while in many villages the victims are still waiting for government help. Relief materials finally reached Phopli VDC on the third day. The VDC has suffered the highest human casualties, with 24 confirmed deaths and over 150 families displaced. Tarpaulins, clothing, food items and other relief materials were distributed among the victims. “Road obstructions due to landslides prevented us from delivering relief materials in Phopli sooner. Additional materials will be delivered Friday by army helicopter,” said Chief District Officer (CDO) Janak Raj Pant. To make matters worse for the victims, medical teams have not been able to reach many of the affected areas. “Most victims are suffering from cold as they have had to sleep in the open,” said Obi Ram BK, a local. There is a severe food and medicine crunch in Lung VDC, according to Mahesh Thapa, another local. The victims in Dang are also in a sorry state. The flooded Babai river swept away houses and property belonging to 49 families two years back. They have been waiting for relief ever since. Our expectations from the government have been shattered, said Jaguram Chaudhary of Tulsipur. The recent floods have resulted in more victims, with 34 families displaced and 316 more families also affected by the flooded Rapti river. Locals are skeptical about getting any relief on time. The plight of Chauferi Holiya VDC in Surkhet says much about the sorry state of relief distribution by the government. The Nepal Army rescued 898 flood victims from the VDC on Tuesday and Wednesday. They are putting up at the premises of Jhora Community Forestry under the open sky. “Our food stocks and clothing were swept away by the Rapti,” said Deshrani Yadav, a local. We are left with nothing to eat, he said, adding that they are doubtful the government will bring immediate relief. Similarly, hundreds of flood victims have been living in temporary shelters in the eastern region, including in Nepalgunj and Saptari, Morang, Kapilvastu and Sunsari districts.